Recently graduated in Engineering, ICT or Science? Did you know Albert Einstein started out as a Patent Examiner? 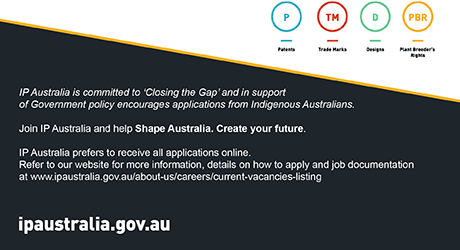 IP Australia offers you the opportunity to start there too, seeing innovation every day. IP Australia is an Australian Government Agency that’s a little bit different. We work with Australians to help them protect their inventions, brands, designs, and plant varieties through the administration of patents, trade marks, designs, and plant breeder’s rights: their intellectual property. We have a strong sense of purpose, ensuring Australians benefit from great ideas. We aim to be an employer of choice, offering a competitive starting salary, real work/life balance, a warm and engaging culture, and ongoing development. We know lifestyle is important to you, and that’s why we offer a flexible working environment so you can enjoy all that Canberra and surrounds has to offer. Enjoy the Multicultural Festival, Enlighten, and the National Gallery of Australia. Cruise the lake in a GoBoat or on a stand-up paddleboard or head to the local rivers for a swim or kayak. Hit one of hundreds of mountain bike trails. Enjoy an eclectic food experience, great coffee, and craft beers in Braddon. Board an international flight from Canberra Airport: the world is closer from Canberra. Avoid the big city traffic and get where you’re going faster. Finish early on a Friday and head to the coast or the snow; they’re both just a couple of hours drive. Jump on a Murrays bus and you’re in Sydney for great concerts and events in three hours. At IP Australia we exercise your brain in different ways, utilising your technical skill and helping you learn how assess applications within a legal framework: developing elasticity of mind and encouraging questioning, debate, and critical thinking. As an employer we offer the ability to contribute to a bigger picture, furthering Australia’s prosperity through the protection of new inventions, designs, and technology. Using your technical knowledge, your critical thinking, and your high-level logic and reasoning skills you will assess, analyse and compare new products; assessing them for patent protection. Ensuring our people have the capability to work with leading edge inventions means you will always maintain currency of skill and you will see Australian innovation at work, right before your eyes. We employ people with a wide range of technical backgrounds and classify examination teams in to one of mechanical, electrical, or chemical fields. We are currently recruiting staff for our mechanical and electrical fields and require physicists, computer scientists, and a wide range of engineers including mechanical, telecommunications, electrical & electronic, and civil. To be successful you must love your field of expertise, be passionate about innovation, and have excellent logic and reasoning skills. Strong communication skills, an insatiable curiosity, and a mind that loves to question are key. Most importantly you want to learn and apply that learning. Starting as a trainee examiner you will be supported by a workplace coach through a competency-based training program to build your expertise. After training you will work independently to examine patent applications and you’ll have clearly defined performance indicators. As part of a team you will also be able to identify work group priorities and achieve team goals. You will need to hold a recognised degree in one of the detailed disciplines or similar fields. Chat with our contact officer - details on our careers page. Information related to the salary range can be found in IP Australia’s Enterprise Agreement 2017 – 2020. IP Australia embraces and fosters a culture that supports diversity, inclusion and respect. Our goal is to attract and retain the right people for the right jobs, no matter their gender, ethnicity, age, religious beliefs, or personal commitments. We empower our people to fulfil their potential and welcome people with diverse experiences, perspectives and backgrounds. This means that we embed diversity and inclusion in everything we do - everyday.